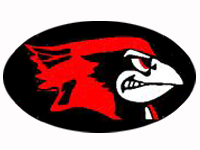 The Ell-Saline Cardinal varsity basketball squads were swept at home Tuesday evening by the Sterling Black Bears in a Heart of America League doubleheader. The Sterling (12-4, 5-0) girls started off the night in fine fashion. After racing out to a 19-5 lead following the first quarter, the Black Bears cruised to a 62-25 win. Freshman standout Kali Briar poured in 18 points to pace the Sterling offense on the night, while sophomore reserve Kindist Wilson added 13 points off the Black Bear bench. Ell-Saline (0-16, 0-7) was led by a strong effort from freshman Raleigh Kramer. Making her first varsity start, Kramer earned team-high scoring honors with a ten-point effort. Sophomore Brynna Rowley chipped in six points for Ell-Saline in the loss. In the nightcap, the Ell-Saline boys got off to a tremendous start to hold a 20-12 lead after the first quarter. The Cardinal offense flew south from there, as Sterling used a 17-4 second quarter to turn an eight-point deficit into a five-point lead at halftime. The Black Bear offense continued its assault in the second half, outscoring the Cardinals 41-24 to lead Sterling to a 70-48 win. Sterling (3-12, 1-4) enjoyed a balanced offensive attack in the victory. Senior Max Dutton lead the Black Bears with 17 points on the night, with freshman Cody Oden adding 13 points. Senior Ryan Birzer and junior Brady Myers each chipped in double-digit efforts as well, finishing with ten points apiece. Ell-Saline (3-14, 1-6) was paced by the sophomore duo of Treyton Peterson and T.J. Morrical, who shared game-high honors with 17 points a piece. Junior Sawyer Kramer added eight points in the the Cardinal defeat.